The possibility that Trump is in Putin’s pocket is scarier than any crimes Mueller might uncover. Even if Mueller doesn’t find a smoking gun, Trump still might be in Putin’s pocket. U.S. President Donald Trump and Russian President Vladimir Putin talk after a meeting on the closing day of the 25th APEC Summit on Nov. 11. During the hearing with Deputy Attorney General Rod Rosenstein on Wednesday, some members of the House Judiciary Committee did not try to conceal their attempt to discredit and derail special counsel Robert Mueller’s investigation into possible collusion between the Trump campaign and Russia during the 2016 election. The way that the Russia investigation has been framed has made it easy for them to do that: Its legitimacy appears to rest on finding a smoking gun of criminality—a simple yes or no on whether any of the cast of characters in this saga committed a serious federal offence. But making this merely about the bright line between illegality (criminality) and legality means that most Americans are missing what is right under our noses. To wit, there is no question that Russia made multiple, unprecedented attempts to penetrate a U.S. presidential campaign, that its approaches were not rebuffed, and that its contacts were sensitive enough that everyone, to a person, has concealed them. These facts might never be adjudicated inside a courtroom—they may not even be illegal—but they present a clear and present national security threat that we cannot ignore. We write here to broaden the public understanding of that security threat, and to underscore why the principal part of Mueller’s investigation—which is a counterintelligence probe not a criminal one—is performing a vital role for our country. Russia’s intelligence services, like any intelligence service worth its salt, aims to recruit a variety of assets (aka sources). Assets are a spy’s version of a “toolbox.” Different intelligence operations require different tools, so spies target a wide range of potential assets who vary according to their skills, access, and how they can be utilized. How witting they are of their role and how much control the foreign intelligence service, or FIS, has over them will often depend on how far the asset will have to go to serve the FIS’s purpose. It’s useful to think of recruitment—the process of getting an asset to work on behalf of an intelligence service—in dating terms. Let’s say a guy spots a girl he’d be interested in dating. The first thing he does is assess if she might be interested in dating him, too. To save himself potential embarrassment, he might send a friend over to the girl first, to see how she feels. If she shows interest, then the guy will officially ask her out. Of course, he doesn’t propose marriage on the first date: There is a period of courtship. It might be slow, it might be fast, but if all goes well and it’s a good match, the marriage proposal is the ultimate step. When it happens, it probably won’t come as a surprise; in fact, in the spy context, it might not have to be stated out loud at all. From there, the IO has a “hook” to meet with the target again, and then again. Each time, the IO will slowly ask for more, ratcheting up the risk each time—but always offering enough of an incentive to make it worthwhile for the target to accept. As the tasks requested of the target become dicier, the IO will begin taking the relationship underground. By the time the IO asks the target to do something clearly illegal, not only has the relationship become clandestine, but the IO has collected a whole string of compromising actions the target has performed along the way but probably shouldn’t have—and now the IO has leverage over the target. In short, the key to recruitment is time and subtlety. An intelligence officer doesn’t make a target compromise himself in one fell swoop. Rather, it happens incrementally with each small act that “crosses the line” giving the intelligence officer a bit more control. Before the target knows it, the IO has made the target into an asset. The sheer number of Russia’s attempted contacts with the highest level of a U.S. presidential campaign and then transition team is mind-boggling. They employed Ambassador Sergey Kislyak to engage members of Trump’s team, like Jeff Sessions, Michael Flynn, and Jared Kushner. They put the head of a Kremlin-linked bank under U.S. sanctions in front of Kushner. They used Trump business partners to arrange a meeting between a Russian lawyer and others (including those with ties to Russian intelligence) with Donald Trump Jr., Paul Manafort, and Kushner. They used the National Rifle Association to get another Russian banker close to Putin, Alexander Torshin, in front of Trump Jr. They approached George Papadopoulos through a Russian professor in an effort to set up a meeting with Russian President Vladimir Putin (a professor who also gave information that the Kremlin had dirt on Clinton). They got Carter Page to provide one of their intelligence officers with industry documents and invited him to Moscow and elsewhere for meetings. They used Russian oligarch Oleg Deripaska to keep pressure on Manafort, who was already allegedly being paid by Russian intelligence. They partnered with WikiLeaks, which contacted Trump Jr. They feted Mike Flynn at a gala for Russia Today and paid him. And those are only the contacts we know about; U.S. and European intelligence communities probably know about others. But this list is enough to show that the Russian effort to influence the Trump team involved multiple players, some covert and some less so. The Russians might not have directly orchestrated all of the approaches—in some cases, they may have simply exploited existing relationships—but all of the contacts were useful to them and would have most likely been reported back to the Kremlin in some form. The context of the approaches also reveals that Russian intelligence agencies were working along multiple fronts. We can imagine cyberthieves collecting Democratic National Committee emails, a domestic counterintelligence service providing potential dirt on and assessments of Trump surrogates’ escapades in Moscow, the Ministry of Foreign Affairs leveraging unwitting but pliable contacts, and the SVR—Russia’s external intelligence agency, akin to the CIA—recruiting potential agents-of-influence in and around the campaign itself. Each avenue provided an angle that Russian intelligence could exploit as needed. Here’s where the deception on the part of Trump and his team is telling. Trump and his crew never, not once, considered reporting Russian approaches to their campaign, even after law enforcement and intelligence officials made it public that Russia had attempted to interfere with the election. Rather, at every turn, they encouraged unethical behavior and misled the American people, Congress, and even the FBI, claiming repeatedly they had nothing to do with Russia or Russians—even as evidence continues to surface that reveals otherwise. This inexplicable policy position, combined with the administration’s pattern of deception, suggests two explanations (which are not mutually exclusive): The first is that Russia’s relationship with at least some members of the campaign did proceed, and involved ethically or legally questionable activities that the campaign needs to conceal. Second, it may be that members of the Trump campaign have engaged in problematic activities known to Russia—related or unrelated to the election itself—which Russia now holds as a sword of Damocles over them. Either way, it strongly suggests that Russia could have leverage over those who are now in charge of protecting the United States, rendering them unable to act solely in the interest of our country. The only crime that might reveal a larger effort is conspiracy, which is an agreement among two or more people to commit a crime. But it’s unlikely that there would be evidence of an explicit quid pro quo in the intelligence world. This is because intelligence operations are “compartmentalized”—that is, each asset only knows her own role, but not necessarily to what extent others might be involved—so no one asset would understand or know the full breadth of an entire operation. And since the recruitment process typically happens with a wink and a nod, rather with a brute insistence on favors, the trail of evidence needed to prove conspiracy (as well as an underlying crime) may be sparse. But the truth is that “collusion” with the Kremlin doesn’t have to be criminal to be dangerous. 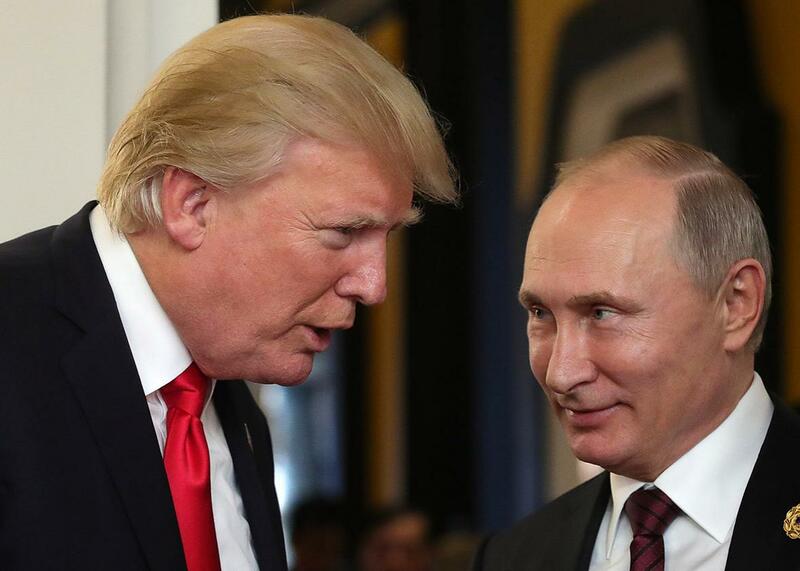 If the Trump campaign received offers of assistance from Russia, and it did nothing to discourage that help (or even encouraged it), it is indebted to a foreign adversary whose national interests are opposed to those of the United States. You can be sure that at some point, Putin will come to collect, if he has not done so already—and when it comes to protecting our democracy the administration will be a puppet of a foreign adversary, not our country’s first line of defense. While the potential criminal aspects of this case need to be investigated, we need to take a good look at what we already know. The national security threat is staring us right in the face. Want to Stop Homegrown Attacks? Start With Locally Driven Violence Prevention.